Kayla Blackmore celebrates OT winner vs SMU. Tommies win the game 2 to 1. The Lady Tommies pulled one out tonight in Halifax scoring a late third period goal and a somewhat flukey goal in overtime for a 2 to 1 victory over the Saint Mary's Huskies. The Tommies were full marks for the win but it sure was cutting it close. It was the Huskies who scored first at 16:53 of the opening period when Haley Tretiak potted one on the powerplay. Shots were even at seven apiece at the end of the period. There was no scoring in the second period and nothing doing until late in the third. Emily Francis banged home the tying goal at 18:18 with assists to Blackmore and Marcelline. After regulation was over the shots favoured STU 28 - 22 and we headed to overtime. In the extra period the Huskies had more shots but it was the hustle of Kayla Blackmore that paid off big for the Tommies. 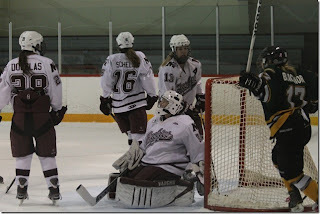 She stole the puck in the Huskies end and tucked the puck behind a stunned Bria Sharkey for a come from behind STU win. 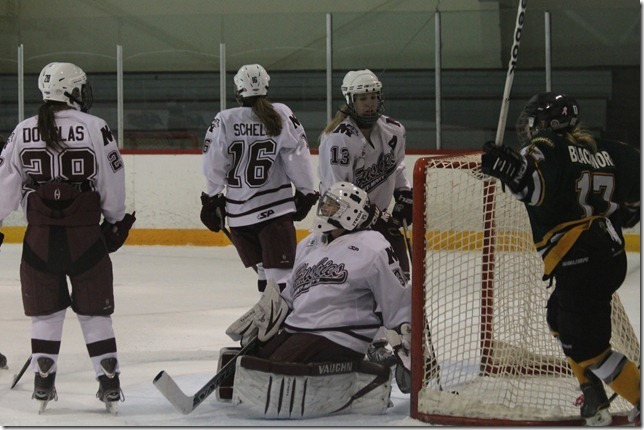 Julia Sharun picked up the win facing 28 Huskies shots and was solid all evening. This was a big come back win for the Ladies, not only in the game itself but also rebounding after last nights humbling loss in Antigonish. Sometimes some adversity is a good thing for a team to have. They will learn what it takes to be a winner. Hopefully next time they play St. FX they will have all players healthy and all lines back in order so they can play their game!